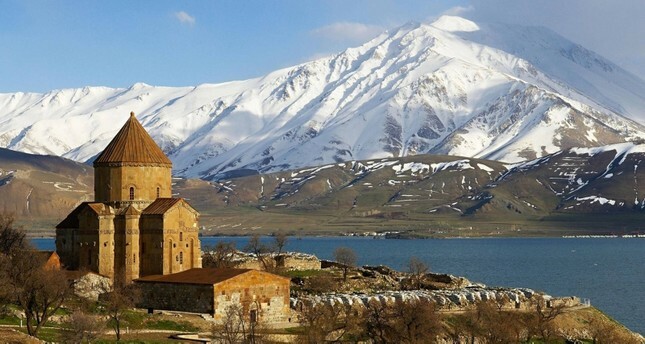 Akdamar Church, a medieval Armenian church located in Turkey's eastern Van province draws the interest of foreign and domestic visitors as an important religious tourism destination. Added to the UNESCO Tentative List of World Heritage in 2015, the church is located on Akdamar Island in Lake Van, which is Turkey's largest. It was built between 915 and 921 A.D. by architect Bishop Manuel, under the supervision of Gagik I Ardzruni, an Armenian king. Believed to be constructed to house a piece of the "True Cross," which was used in the crucifixion of Jesus Christ, the church was restored in 2005. The Ministry of Culture and Tourism approved a 4-billion-lira (around $3 billion in 2005) budget for the project, which lasted two years and included several architects, engineers and archeologists. The opening ceremony following the completion of restoration in 2007 was attended by several prominent figures including then-Culture and Tourism Minister Atilla Koç and Gagik Gyurjiyan, former Armenian deputy culture minister, Armenian Orthodox Patriarch Mesrob Mutafyan and ambassadors of 30 countries. The church has been hosting annual international religious ceremonies organized by the Armenian Patriarchate of Istanbul once a year since 2010. Offering visitors a chance for a refreshing swim along its beaches, the island also features walking routes adorned with almond trees and spectacular sightseeing opportunities during sunset. "Akdamar Church represents a unique accomplishment in Christian architecture, displaying for the first time sculpted imagery on the exterior of a church in such an elaborate profusion," according to the UNESCO website. Muzaffer Aktuğ, Van provincial director of culture and tourism, told Anadolu Agency that the church deserves to be included in the permanent list of UNESCO. "Around 83,000 people visited the island in the first seven months of this year," Aktuğ said. He added that efforts were underway to get the church on UNESCO's World Heritage list.